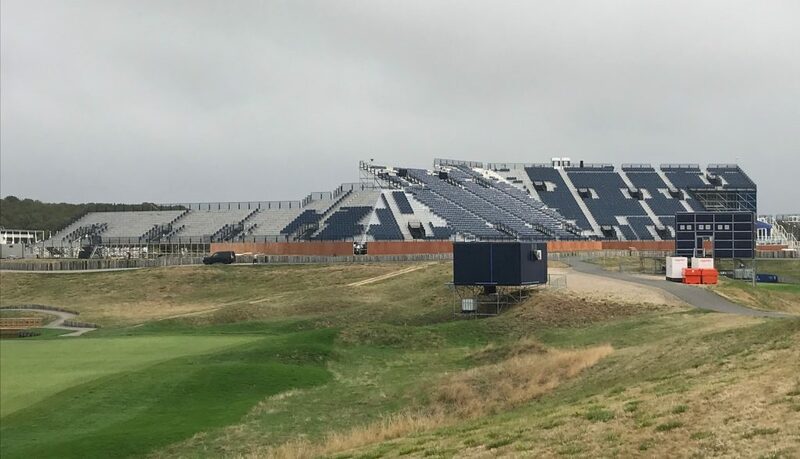 Nolan Associates with GL Events have completed the design for the temporary grandstands and corporate facilities around the Albatros course at Le Golf National course near Paris where the Ryder Cup 2018 will be staged between 25th and 30th September. On the day when European captain Thomas Bjorn has announced the selection of Paul Casey, Sergio Garcia Ian Poulter and Henrik Stenson as the captain’s wild card choices for the European team the final touches have been put to the course facilities. The captains picks compliment the 8 ranking picks of Francesco Molinari, Rory McIlroy, Alex Noren, Thorbjorn Olesen, Tommy Fleetwood, Tyrell Hatton, Justin Rose and Jon Rahm. The course designed by architects Hubert Chesneau and Robert Von Hagge, in collaboration with Pierre Thevenin, it is located in Saint-Quentin-en-Yvelines, southwest of central Paris and will be the first used in France. The designs for the course have been a massive undertaking. The temporary grandstand to the 1st tee and 18th green will provide seating for over 6500 spectators. 9 others grandstands are sited around the greens across the course. GL events undertake temporary seating and infrastructure for all major outdoor events including concerts and sports. Recent projects include The Open Golf, Sochi Grand Prix and the London Olympic Stadium Conversion.